Press moulded milk glass bowl curving inwards to footring base. Stem handle with knob end. Originally, Glasbake ramekins were made from borosilicate glass. The composition was changed for some products to tempered soda lime glass that is now the most common form of glass used in glass bakeware and has a higher mechanical strength so is less vulnerable to breakage when dropped (the leading cause of breakage in glass bakeware). It began producing under the “Glasbake” brand to compete with PYREX, although it was originally advertised as “Glasbak”. They were made in the town of Jeannette Pennsylvania, once the worlds’ largest glass manufacturer, thanks to a deposit of natural gas, discovered by salt miners. Shifting world markets means that now only two glass-makers are left; St George Crystal, producing giftware, tableware, lighting components, projection television components, bowls, chandeliers and Christmas ornaments; and; Jeannette Specialty Glass. These ramekins are made from a glass-ceramic. The manufacture of this material involves a process of controlled crystallization. NASA classifies it as a “Glass-Ceramic” product. Glass-ceramic materials share many properties with both glass and ceramics. They have an amorphous phase and one or more crystalline phases and are produced by a “controlled crystallization” in contrast to a spontaneous crystallization, which is usually not wanted in glass manufacturing. Glass-ceramics usually have between 30% [m/m] and 90% [m/m] crystallinity and yield an array of materials with interesting thermomechanical properties. The McKee Glass Company was founded in 1843 (As McKee and Brothers Glass) in Pittsburgh, PA. The company was eventually purchased by Jeannette Glass in 1961. McKee Glass not only made items under its own name but also produced under the "Glasbake" name. The Jeannette Bottle Works Company was established by the Crock family in 1887, and got its start producing hand made bottles, in Jeannette, Pennsylvania. Originally known as the Jeannette Shade and Novelty Company. 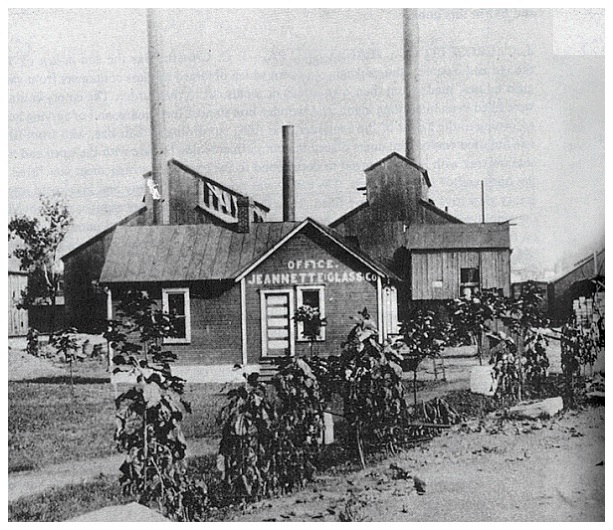 In 1898 the Jeannette Bottle Works was succeeded by the Jeannette Glass Company. The Crock family owned the company until 1976 when Ted and Kathleen Sarniak purchased it. With the advent of the O’Neill semi-automatic bottle-blowing machine in 1899, Jeannette soon found itself producing wide mouth jars, relishes and other useful pressed glass items like automobile headlamp lenses. In 1970 Jeannette Glass Co. became Jeanette Corporation. From its opening until the early 1900s the company focused on making handcrafted wide mouth bottles, dishes, automobile headlight lenses, druggist bottles, and pickling / canning jars. In 1917 Jeanette expanded its operations to include prism glass, which neatly lead to creating depression era kitchen pieces for which the company is still known. By 1904 the company was involved in producing items for medical and home use. Jeannette continued to grow and expand and by 1924 they began producing the lovely tableware we call Depression Glass today. This innovative company was one of the forerunners in producing the machine made, colored pressed glassware, we call Depression Glass today. Many of the Depression Glass patterns that we know and love today were produced by the Jeannette Glass Company. Some of the more popular patterns produced were Adam, Anniversary, Cherry Blossom, Doric, Doric and Pansy, Floral Poinsettia, Floragold, and Iris. Jeannette established its hold on the kitchen item market early in the Depression Era, designing and producing many kitchen items in pink, green, crystal, and ultramarine. They were one of the major producers of Jadite and Delphite Glassware. Many of the most desirable Depression Glass kitchen items were made by The Jeannette Glass Company. After the War the Jeannette Glass Company, like many others, experienced a slow down. In 1961 Thatcher Glass purchased the firm, later changing the name to Jeannette Corporation Not all of Jeannette’s glassware bore a maker’s mark. The vast majority that did were various kitchen glasses. The mark to look for is a square or triangle with a capital J in the middle. In 1969 they acquired Royal China and Harker Pottery and continued to produce glassware for both wholesale and retail businesses until 1983 when the Company closed its doors.